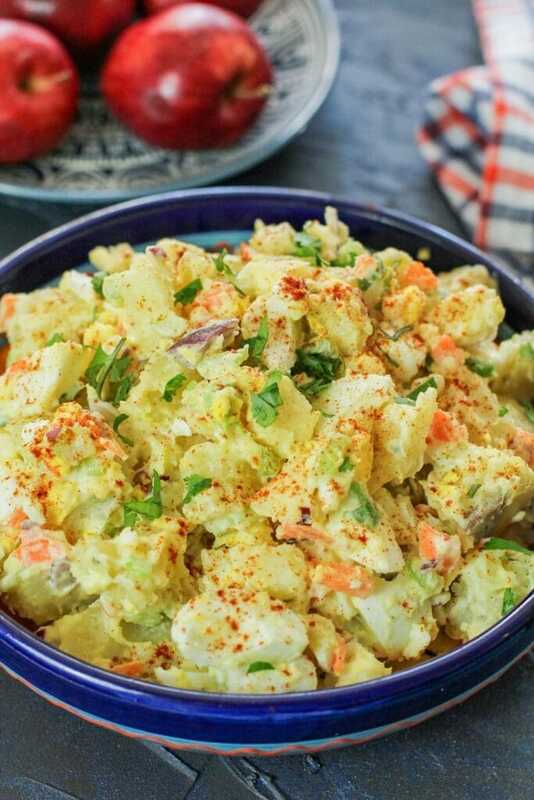 Puerto Rican ensalada de papa con manzana is a Puerto Rican potato salad with apples recipe that is easy to make and the perfect surprise at your next get together! 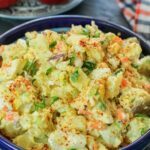 Potato salad is a potato dish that is typically mayonnaise based, but you can make a vegan version, or an olive oil version (check out my Shrimp potato salad without mayonnaise). 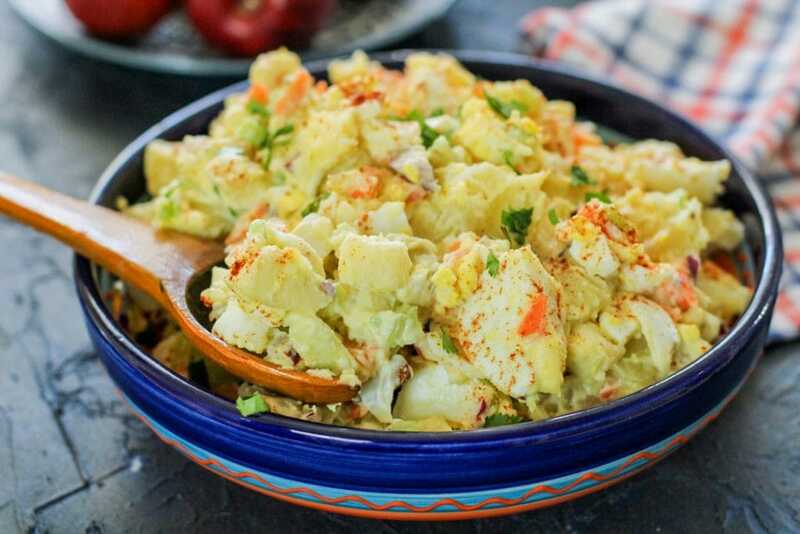 Traditionally, potato salad includes larger bite sized potatoes that are pre-boiled, then the potato salad has chopped boiled eggs, onions, celery, and mayonnaise and is topped with paprika. This is the classic potato salad recipe. 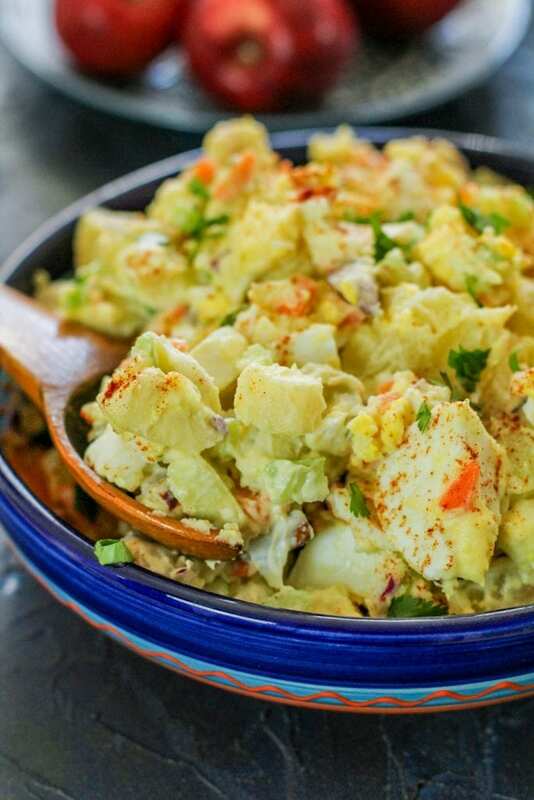 For this simple Puerto Rican potato salad recipe, we are twisting it by adding in chopped apples, which offers the potato salad a sweet bite every so often, without taking away from the beauty of the potato salad. Should potato salad be served warm or cold? Potato salad has dairy in it, so it should be refrigerated as soon as it is made. If you’d like to make a warm potato salad, check out this recipe by What’s Gaby Cooking! If you’re taking this ensalada de papa with you to a potluck or get together, place it into a closed lid container and place it in a cooler with ice. As long as it is cold, it will keep the potato salad from going bad. Can potato salad be heated? Potato salad can be heated in the microwave for a few seconds, but remember that there is mayonnaise in it, so to keep the potato salad from being rancid, do not heat the potato salad twice. Serve yourself the portion desired and microwave for 15-30 seconds for a warm potato salad. No, you should not freeze potato salad. Potato salad has eggs, mayonnaise, and soft potatoes in it. If you freeze it, the texture/taste will not be the same. Do not freeze leftover potato salad. Potato salad will last in the fridge, covered for up to 3-4 days. To make potato salad (ensalada de papa), you need to peel the potatoes (if desired), boil the potatoes in a large pot with salted cold water. If you’re wondering, how long to boil potatoes for potato salad, it’s once the potatoes are fork tender about 15-18 minutes after the potatoes have started boiling. You want to add your potatoes to cold water, so the potatoes cook evenly. If you add the potatoes to boiling water, it will cook unevenly. For this Puerto Rican ensalada de papa, I personally like to add some vinegar over the potatoes while it is still hot. Next, you add in your chopped vegetables like your raw onions and peppers, apples, seasonings and the mayonnaise (or miracle whip) once the potatoes have cooled a bit to keep them from breaking apart. Finally, you need to refrigerate the potato salad for at least half an hour to allow the flavors to infuse together before serving. My aunt Gloria introduced me to this this Puerto Rican potato salad when I was super young. I’ve been addicted to potato salad with apples (ensalada de papa) ever since! Tell me in the comments below, have you ever had potato salad with apples in them before? What is potato salad good with? Wondering what side dishes or meat dishes go well with potato salad? 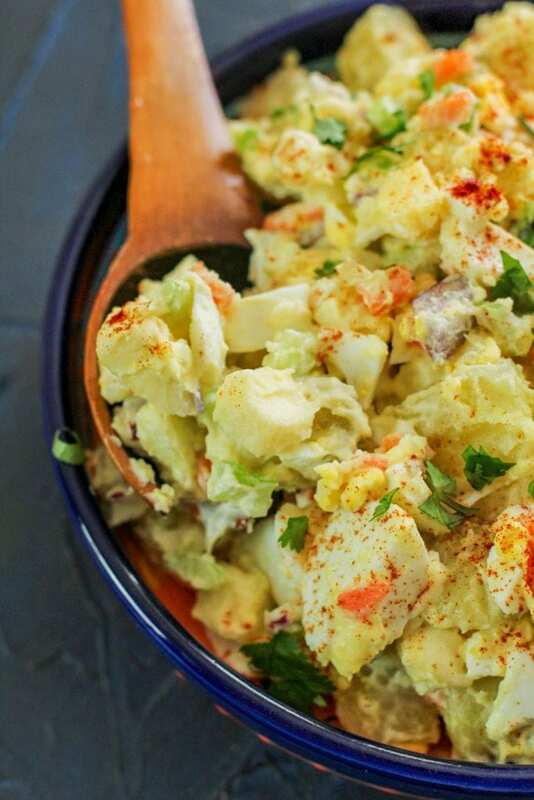 Here are some amazing recipes to serve with Puerto Rican potato salad! This ensalada de papa (potato salad recipe) is amazing with the slightest crunch and sweetness that apples have to offer! Once potatoes have cooked to become fork tender (about 15 minutes after water begins to boil), drain potatoes. Add potatoes to a bowl, and while it's still hot, drizzle vinegar over it. Let potatoes cool a few minutes before gently adding in remaining ingredients. Gently, toss together ingredients to coat it all. Garnish with paprika and cilantro, refrigerate for at least half an hour before serving. yes, my dad used to make it this way.